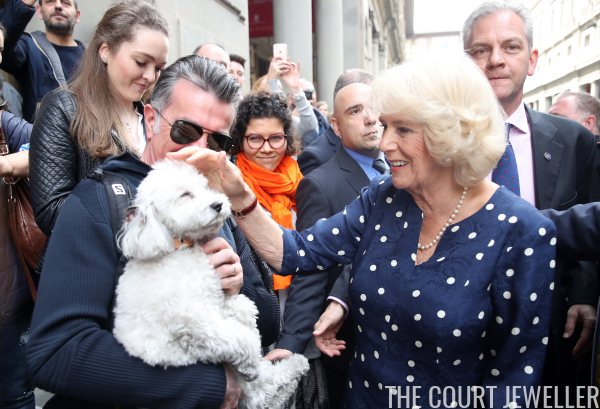 On the third day of her visit to Italy, the Duchess of Cornwall wore pearls for a series of engagements in Florence. 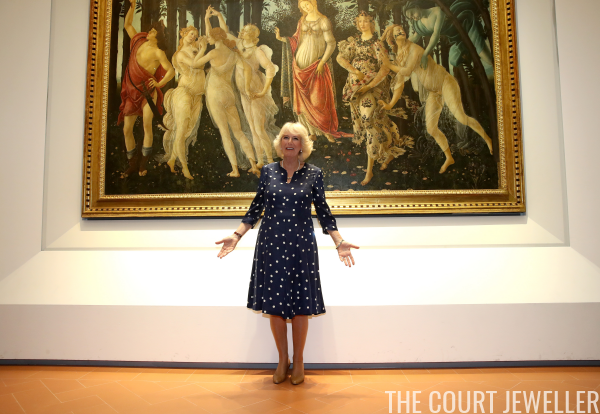 While Prince Charles visited one of the locations devastated by last year's earthquake, Camilla stayed on in Florence. 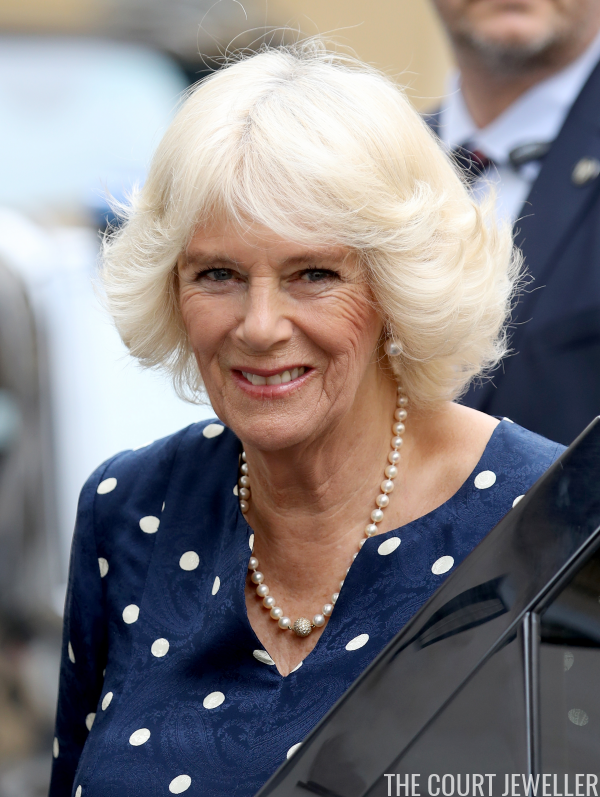 For the day's engagements, she wore diamond and pearl earrings with a single-stranded pearl necklace. The necklace also includes a pave-set diamond bead. She also wore her engagement and wedding rings, her gold and gemstone bracelet, and her watch. Here's a look at her entire ensemble. Her navy blue dress features a subtle paisley print overlaid with bold white polka dots. 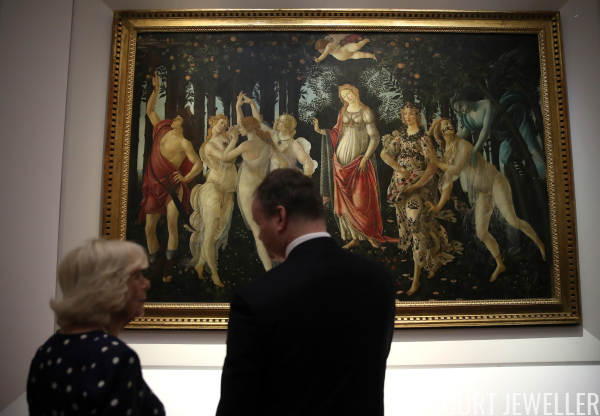 Camilla's day in Florence included a trip to the Uffizi Gallery, where she viewed famous paintings like Botticelli's Primavera. She was given a tour of the gallery by its director, Dr. Eike Schmidt. She paused outside the gallery to meet a furry Italian admirer. 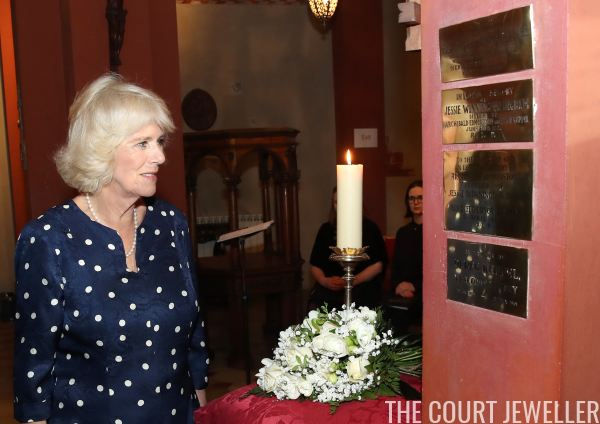 Camilla also stopped at St. Mark's Anglican Church, where she viewed a memorial plaque to her great-grandmother, Alice Keppel. Alice, who was the last mistress of King Edward VII, died at her Italian villa in 1947, and she is buried in Florence.